July 21, 2017 - Yosed Zvi Salomon was one of three family members murdered in their home in the West Bank settlement of Neve Tzuf-Halamish. 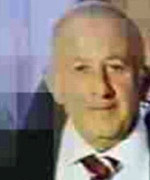 Yosef Zvi Solomon (70), a resident of the West Bank settlement of Neve Tzuf-Halamish for 34 years, was one of three victims from the same family who were murdered in a terrorist attack in their home on Friday night. The two other victims were Yossi's two adult children, Chaya and Elad. The family had gathered together for the Sabbath to celebrate the birth that morning of a new grandson in the family. They were expecting friends to join them when, instead, a Palestinian, resident of the nearby village of Kubar, burst into the house and attacked the family with a knife. The assailant was shot and wounded by an off-duty IDF soldier who heard screams from the neighboring house and rushed to assist. Tova Salomon, 68, Yosef's wife and the mother of the two other victims, was wounded in the attack. Yossi was well-known in the community for his pleasant demeanor and sense of humor. He is survived by three other children and 15 grandchildren. He and his children Chaya and Elad were accompanied by thousands of mourners to their final resting place on Sunday evening (23 July 2017) in the Modi’in cemetery.